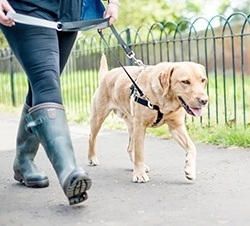 While leisurely walks are a time of fun and excitement for canine companions, they can be a huge headache for owners that aren't prepared. Dogs are notorious for pulling on their leash. They often walk ahead to lead the pack and can veer off at the simplest distraction. For owners, this behavior can be troublesome. Pulling on the leash can lead to a host of problems. If the dog is big and powerful, this constant tug can be very uncomfortable on the arm. It also forces you to walk briskly rather than taking it easy. The behavior can also cause the collar to choke the dog or cause potential neck issues. To avoid these problems, it's a good idea to invest in a no pull dog harness. No pull harnesses are a unique variation of the standard harness. They're designed to be more comfortable for owners and dogs alike while also promoting better habits. There are a number of great harnesses on the market designed for dogs of all shapes and sizes. But how do owners pick the best option for their pup? 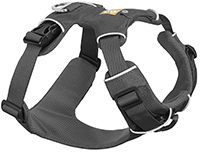 This versatile harness from Chai is designed to eliminate pressure on the dog's back and spine. It's padded along the chest and belly to prevent any sharp pains. An oxford material outer layer provides durability and strength. A durable zinc-alloy O-ring on the front allows you to pull the dog in your direction during training. A second D-ring is located on the top of the harness for lighter control. The harness features mesh webbing and reflective material for added safety during night walks. There's also an added seat belt attachment for car rides. It's available in a variety of colors and sizes. Strong buckles and adjustable straps allow you to get the perfect fit. Designed for active dogs, the no pull harness from Ruffwear is made from high-quality materials that can withstand the elements. Comfortable padding is located throughout to keep your dog safe and comfortable. Four adjustment points make getting a snug fit easy. There are two separate clips for versatile use. A V-ring on the center of the back is great for casual walks while the reinforced loop on the front is designed for training. The trim is made from reflective material for safety. There's even a handy ID pocket to keep tags secure on an adventure. The harness is available in a variety of different vibrant colors and sizes. With a light and simple design, this no pull harness is easy to operate and very comfortable for dogs to use. It's made from a durable polypropylene webbing material and only features a basic harness design. There's no extra panels, rings, or padding to get in the way. The leash clip is located on the front for easy control of your dog. It's designed to eliminate strain and prevent choking. The simple construction also prevents unnecessary chafing. The harness is available in a few different colors and sizes to suit any dog. For added safety, the harness also utilizes 3M Scotchlite material that reflects light from hundreds of feet away. As a leash and harness combo, this option provides you with everything you'd need to start training your dog. It features two separate leash attachments. 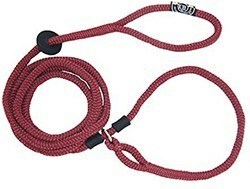 A leash can be attached to the front to discourage pulling, on the back for everyday use, or both for ultimate control. The harness itself is made from strong webbing. The edges of the webbing are curled outward away from the dog's skin to prevent irritation. Not only that but the strap that goes behind the dog's legs are lined with a soft velvet to avoid chaffing and discomfort. A loop on the back of the harness prevents twisting. It also makes the harness tighten slightly if the dog pulls for easy training. 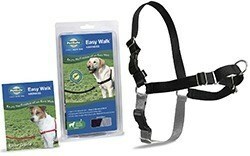 The PetSafe Easy Walk harness is simple in design but effective in breaking bad habits. The harness prevents pulling and sits across the dog's shoulders rather than around their neck. This makes it easier to train the dog while also preventing choking or neck injuries. It's made from a high-quality webbing material and features four points of adjustment for a snug fit. 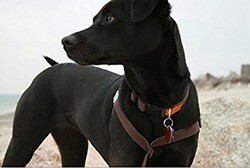 A durable clip on the front of the harness makes it easy to lead the dog in the right direction. Two quick release harnesses make it a cinch to put on. The bottom strap is also colored differently, ensuring that you put it on correctly with no issues. 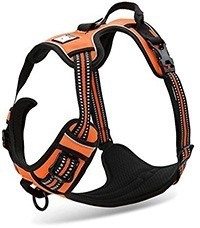 This harness doesn't feature any complicated buckles or even adjustable straps. It's a simple harness and leash system that doesn't contain separate parts. The unique design slips over your dog's body and uses simple loops to get a custom fit every time. Black stops make it easy to align and loop the leash. It's made from a tough hand-spliced rope with a tensile strength of 4,000 pounds. The material is very soft and contains no hard edges. It helps to prevent pulling by tightening over the dog's body only. There's no tightening around the neck at all. It's a simple yet effective option. There are a few different types of no pull harnesses owners can choose from. These three basic designs are used to tackle unique issues a dog may face while on a walk. Front clip systems are made to stop dogs in their tracks as they start to veer off course or pull. As the name suggests, the clip for attaching the leash is located on the front of the dog's body. Various straps wrap around the chest and meet at the single clip point. Placing the lead on the front of the chest makes it difficult for dogs to pull without feeling the ramifications. When they pull, the dog will feel a slight tug to the side. As a result, their body has turned away from their destination, making them stop. Eventually, this tugging will deter the dog from pulling. They'll learn that pulling will cause discomfort and make it difficult for them to walk in the direction they want. Tightening harnesses are a must-have for dogs that are determined., Larger and ﻿﻿﻿﻿﻿stronger dogs will need a bit of extra training to prevent pulling. 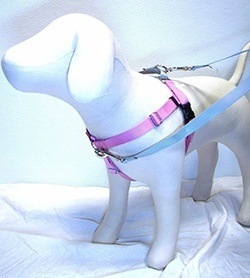 These harnesses are designed to send a physical signal to the dog when they start to pull. The various straps of the harness will tighten the more the dog pulls. This tightening sensation can be uncomfortable for larger dogs. It will force the dog to slow down and release tension. The lead for a tightening harness is also located on the front to provide owners with a bit of extra control and guidance. It's important to choose a tightening harness that's soft and doesn't cause any actual pain. Cheaper options may cause a sharp pain rather than a bit of pressure. A head harness or head collar is a unique option for dogs that need even more guidance and training. Rather than hugging the dog's body, these harnesses are wrapped around the dog's head. A strap wraps around the neck like a traditional collar. However, an additional strap goes over the dog's snout. The leash clip is placed just below the chin. This type of harness is perfect for the worst pulling offenders. 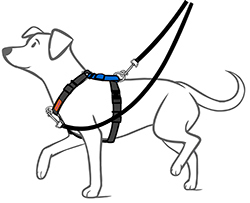 When a dog starts to pull, the harness will cause the dog's head to turn towards their owner. They are forced to look at the owner and stop. While effective, these harnesses can take a bit of getting used to. It's important to give dogs some time to get comfortable with how they feel before going on a walk. 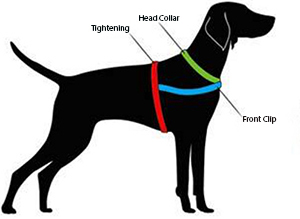 A no pull harness can make an immediate difference in how your dog acts during a walk. If the pup is used to walking with a standard harness or collar, the unique feeling of a harness may confuse them a bit. Regardless of the type of harness you choose, it's recommended to do a bit of training as well. Training your dog to walk on a no pull harness will fix common behavioral issues and improve their ability to walk by your side without the harness. The first step to proper training is to ensure that the harness fits the dog correctly. Poorly-fitted harnesses can be uncomfortable on the dog. It should be snug but not tight enough to dig into the skin when they pull. The harness should also be tight enough to ensure that the dog won't slip out if they get distracted and try to take off. The leash should also be prepared prior to the walk. The best option for training is a fixed leash that measured approximately six feet in length. While retractable leashes are great for trained dogs, they can make it difficult for dogs to learn their limits. A relatively short leash lets them know that they need to stay close. A knot should be tied approximately two feet from the lead. 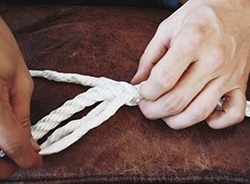 The knot is a critical training tool for owners. As you walk, you should hold the knot in the hand that's closest to the dog while the rest of the leash length is held in the opposite hand. The knot will let you know when the dog starts pulling without having the entire leash extended. It's also an indicator of how close the dog should be at all times. When it's time to take a walk, make sure to have plenty of treats on hand. Treats are crucial for rewarding your pup when they do good. They should be given regularly as you walk as long as the dog is behaving. Communication with your dog during the training session should involve two words, such as "easy" and "oops." These two words should be short and easy to remember. They need to be used on every walk from here on out, so make sure that it's something that's easy to say. One word will be used to warn the dog while the other is used to show them that they did something wrong. As you start walking with the knot in your hand, keep an eye on your pooch. While they might start by your side, they'll eventually get distracted and forget you're there. They may start to get ahead of you and pull. When this happens, you will feel it in the knot. When this occurs, you should say, "easy!" At first, this word will have no meaning to them. However, it's important to use it anyway as they'll begin to associate it with their behavior in no time. Once your dog has pulled the entire knotted portion of the leash, it's time to say, "Oops!" When you say this, immediately turn around and start heading in the opposite direction. When you do this, let go of the knot. The no pull harness will do its job and force the dog to pay attention to you again. Letting go of the knot and heading in the opposite direction will give your dog the chance to catch up and get by your side again. If your dog gets by your side, hold onto the knot again, praise and treat them for coming to you, and continue with training. Simply repeat this cycle of "easy" and "oops" until your dog catches on. Make sure to reward them for listening and behaving. The longer you can walk with the dog by your side and doesn't pull, the more you should provide praise and treats. Make sure to reward more if they behave in distracting situations like a passing squirrel or dogs. Eventually, your verbal indicators will let them know when they're pushing it and when they've made a mistake. While they might not mean much at first, the dog will start to recognize the pattern and respond to your words. Over time, your dog will learn how to behave and walk with a loose leash by your side at all times. You don't have to settle with being pulled every time you go for a walk. With the right no pull harness, you can train and guide your dog. These harnesses provide you with complete control over your dog on your walk. Regardless of whether you choose a front clip system, tightening harness, or head harness, the unique designs teach your dog how to stay ny your side instead of getting distracted and pulling you forward. With time, these harnesses will correct behavioral issues and allow you to take your dog on a walk with confidence and plenty of leash slack.